This is the sad story of a boy who grew up without a mother and went to war leaving a little boy at home who grew up never knowing his father. 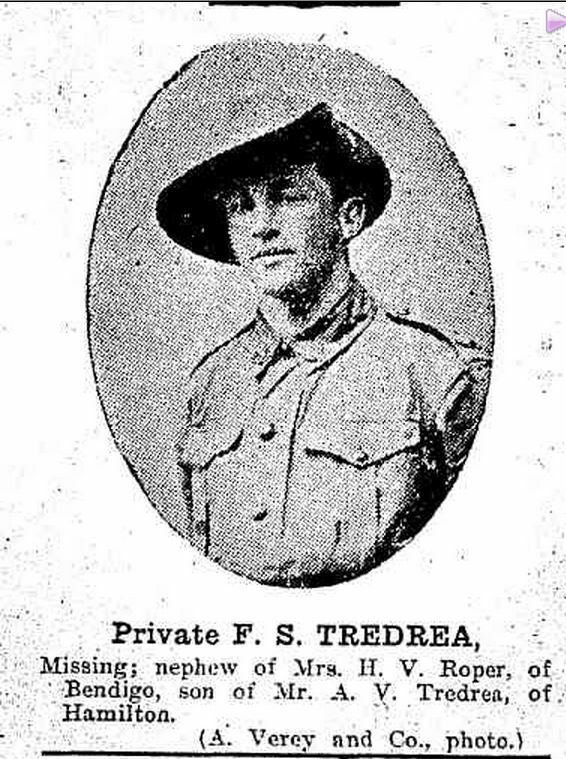 Francis Stanley Tredrea was born in Hamilton in 1891 to Hamilton born parents, Abraham Tredrea and Annabella McLeod. Abraham, a tailor and Annabella were married the year before the birth of Francis, their first-born. But tragedy struck as Annabella passed away in the same year as Francis’ birth, most likely the result of the birth. Heartbroken Abraham did not marry again and raised his little boy himself. When Francis was old enough, Abraham took him on as an apprentice tailor. In 1914 aged twenty-five, Francis married Ada Annie Walker of Stawell and they were soon expecting their first child. 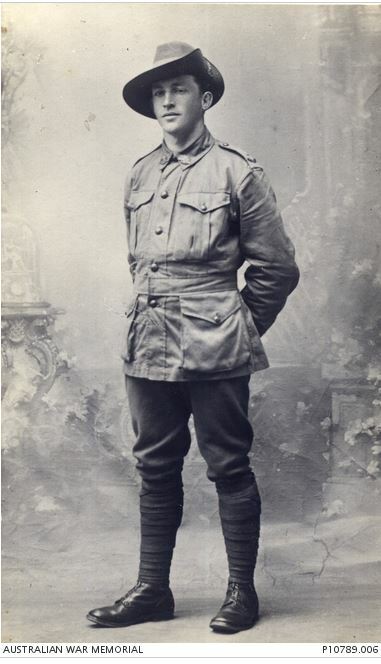 On 25 July 1915, Francis enlisted with the 21st Battalion. It’s unclear if Ada had given birth to their son, Harold Hamilton Tredrea by that time. Soon after arriving in Egypt, Francis was transferred to the 60th Battalion and in June the battalion proceeded to France. Arriving on 28 June 1916, the battalion was thrown into the deep end with their first major battle on 19 July 1916 giving them no time to settle into trench life as they would have if they had arrived at a “quiet time.” The battle they were thrown into was the Battle of Fromelles and the 60th battalion suffered heavily with 757 casualties. Men were wounded and dead, others were missing. One of those missing was Hamilton’s Francis Tredrea. “MISSING SOLDIER.” Bendigonian (Bendigo, Vic. : 1914 – 1918) 5 Oct 1916: http://nla.gov.au/nla.news-article91386121&gt;. News of Francis reached Hamilton and his wife Ada and father Abraham held out hope Francis was a prisoner of the enemy. By October, there was still no news. Six months passed and his status was still “missing.” Out of desperation, in February 1917, poor Ada placed a notice in The Argus, seeking any news of Francis. “MISSING SOLDIER.” The Argus (Melbourne, Vic. : 1848 – 1957) 5 Mar 1917: <http://nla.gov.au/nla.news-article1601491&gt;.